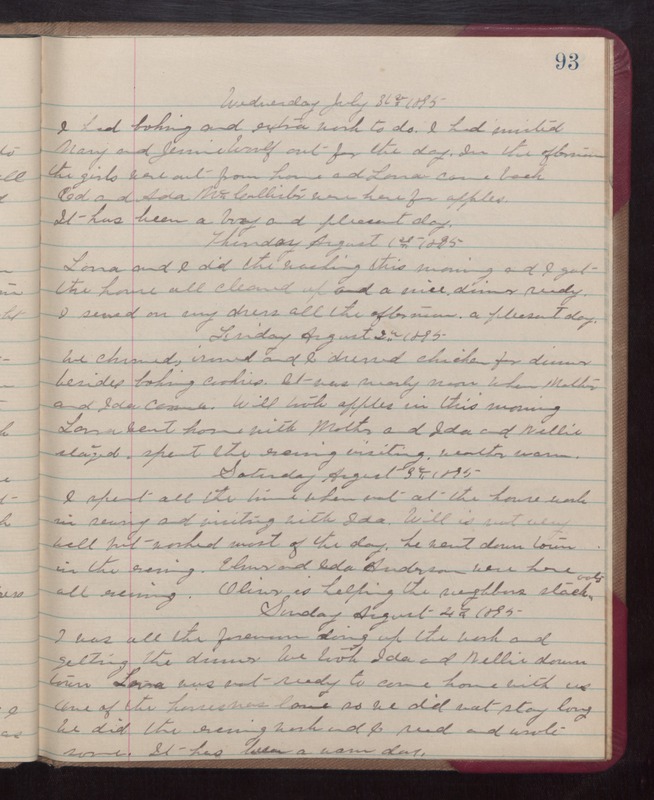 Wednesday July 31st 1895 I had baking and extra work to do. I had invited Mary and Jennie Woolf out for the day. In the afternoon the girls were out from home and Laura came back Ed and Ada McCallister were here for apples. It has been a busy and pleasant day. Thursday August 1st 1895 Laura and I did the washing this morning and I got the house all cleaned up and a nice dinner ready. I sewed on my dress all the afternoon. a pleasant day. Friday August 2nd 1895 We churned, ironed and I dressed chicken for dinner beside baking cookies. It was nearly noon when Mother and Ida came. Will took apples in this morning. Laura went home with Mother and Ida and Nellie stayed. spent the evening visiting. weather warm. Saturday August 3rd 1895 I spent all the time when not at the house work in sewing and visiting with Ida. Will is not very well but worked most of the day. he went down town in the evening. Elmer and Ida Anderson were here all evening. Oliver is helping the neighbors stack oats. Sunday August 4th 1895 I was all the forenoon doing up the work and getting the dinner. We took Ida and Nellie down town. Laura was not ready to come home with us. One of the horses was lame so we did not stay long. we did the evening work and I read and wrote some. It had been a warm day.